Powered by, extended intelligence, NLP and human insights, the news aggregator offers in-depth analysis. , Logically believes that, media and technology firms should do more to combat the issue, especially when many people are cautious about government intervention. Logically, a leading global tech start-up with a mission to foster social change, today announced the launch of its intuitive, human-centric platform powered by Extended Intelligence (EI) machine learning, Natural Language Processing (NLP) and human oversight to empower citizens to combat fake news and misinformation on any topic, available to everyone on Android, and the web. According to a recent survey by the Internet and Mobile Association of India (IAMAI), while a majority of the population do not blindly trust opinionated propaganda or social platforms, over four in ten Indians haven’t heard of fact-checking as a solution to ascertain facts. 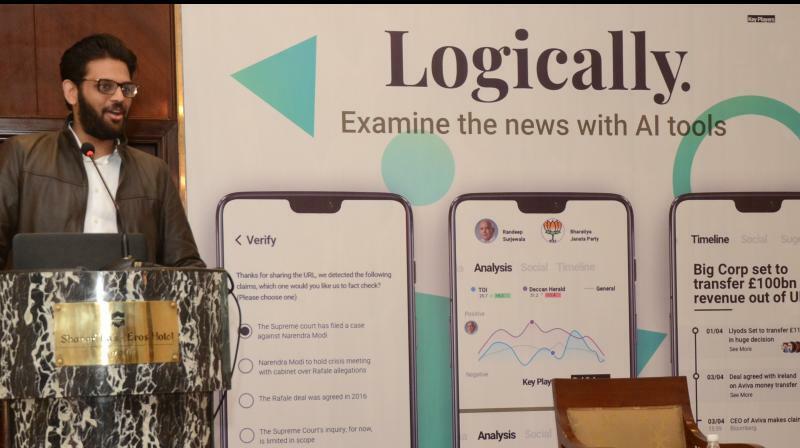 "Because of this, Logically is simultaneously announcing its Indian fact-checking initiative as well as the launch of its news aggregation platform. Though the fact-checking operation is a distinct part of Logically's output, users will be able to use the Logically app to send claims to the fact-checking team who will respond to you directly once they have concluded their investigations." With rising concern over misinformation, Logically believes that media and technology firms should do more to combat the issue, especially when many people are cautious about government intervention. This is where Logically’s EI news aggregator comes in handy; offering a broad, in-depth overview of the news. Users can read through a brief, AI-generated synopsis of each story, see different perspectives, and get contextual information on the key people, places, and institutions involved. Logically also plots the sentiment of news articles towards entities from specific publishers and the media as a whole – curating a timeline of how the stories have evolved while filtering hateful, offensive rhetoric. Stimulating informed social conversation, this novel platform empowers citizens to fact-check the accuracy of any article they come across - ensuring that they only share trusted news with their network. With notifications and updates on favourite stories, topics and entities, users are in control of the news, of the stories they want, as and when they happen as a single, simple, streamlined Newsfeed. Logically taps deep learning algorithms and web graphs of millions of web sites from top publishers around the world to identify top-quality sources for trending, quality news, per category, query, or article. The intent is to provide a broader context for impactful stories, from politics to business and everything in between as the narrative evolves over a period of weeks or months. Significantly, this enables users to contrast and compare the slant on articles from journalists and publishers across the political spectrum, burst their filter bubbles, break down echo chambers, and draw their own conclusions from a multitude of diverse perspectives. With a strong commitment to purge the world of fake news, Logically is scouting for partnerships with publishers, fact checkers and platforms to monitor and provide analysis around fake news and content likely to incite violence. The fusion of AI and human intelligence helps Logically organize news from diverse sources around the web and deliver an enriching experience to keep citizens fully informed about a story.